I took my niece Sarah to see The Lorax for her 10th birthday. I would like to say that in preparation for this environmentally-friendly movie, I prepared some treats using local ingredients and then sneaked them into the theater in my giant, but fashionable bag. I would like to say that, but instead I have to say that we visited the dollar store five minutes before the movie started and I let Sarah choose Swedish fish, Sprite, and pretzels. I then hid these treats in my giant, but fashionable bag. Sarah wanted to get in on the action, so she clandestinely zipped the pretzels up inside her jacket. I’m kind of ashamed to say that I didn’t stop Sarah from eating that entire box of Swedish fish, washed down with sugary soda. I wanted to be the cool aunt, after all. I sold out to her young taste buds, and sent her home to mom and dad filled to the brim with high fructose corn syrup and red dye. This is not something a die hard locavore would do. I’m still experimenting, apparently. Unless someone like you cares a whole awful lot. Nothing is going to get better. It’s not. What I took away from this movie was a sense of purpose, if one can acquire a sense of purpose from an animated film that includes song and dance numbers. Maybe it was an affirmation of my already-known sense of purpose to eat as locally as possible. By caring about the environment and my own health enough to choose local foods, I can make a difference. Knowing where my food comes from, knowing that it’s not factory made (like those Swedish fish, ah! ), knowing that it’s not transported miles upon needless miles to get to me, and knowing that it’s wholesome and sustainably grown is my contribution to my little part of the world. And I get to eat really good food in the process. 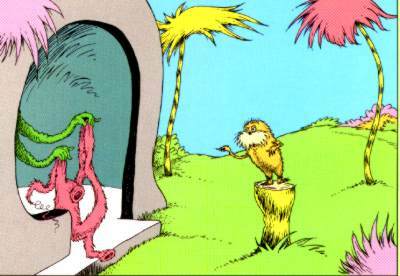 The Lorax kind of reminds me of Joel Salatin (of Food, Inc. fame), a farmer in Swoope, VA that subscribes to a sustainable, “beyond organic” approach to farming on Polyface Farm. Time Magazine featured him last October. In that article Joel says, “It’s up to people to step up and think responsibly about their food.” Regardless of political views and big business practices, the individual must decide to be responsible for his or her own food choices and demand a better way. Lorax-esque, don’t you think? My aunt and uncle live in the redwood forests of Mendocino County in Northern California — gypsies amidst the lumberjacks and timber companies. I remember being disheartened but not surprised when they told me many years ago that “The Lorax” had been banned from their school district. Wow. I wonder if it’s still banned. That’s crazy! I was so good about not stopping either one of you from eating the entire box. I thought, “Just let them have their fun.” haha. My kids are DYING to see this movie (shhh! so am I). They also think it’s very funny when I sneak food into the theater in my extra large purse. Thanks so much for following my blog!